Are you and your home ready for all of the guests who will be coming through your door? 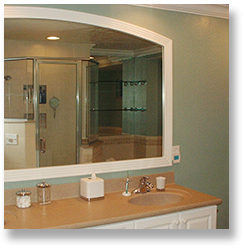 Lemon Bay Glass + Mirror is ready to assist with updating your home before your guests arrive. We have many ways to easily spruce up your home for the holidays and impress your guests. Wow your guests with various upgrades that will give your tired worn out kitchen a fresh new look for entertaining. Since we are in South Florida our winters are mild and we can open up and expand our living right out to the surrounding patio area. > Mirror and Glass Placement: Open up your living space and brighten the kitchen with mirror. > Cabinet Remodeling: Spruce up tired kitchens by adding textured glass doors. > Open Up Rooms with Doors: Sliding glass doors easily glide and expand the living space. Follow this link to read more on Glass Door Inserts. Transform your bath to reflect your personality . Your room will take on a whole new appeal, with some simple glass and mirror treatments. > Frames for Mirrors: Easily add framing to your mirrors and create a whole new look for the room. > Sliding Shower Doors: Remove the shower curtains and add the ease of a sliding glass door. > Update the Shower Enclosure: Take years off a bathroom by remodeling the shower. Follow this link to read more on shower enclosures. Connect with Lemon Bay Glass and find out how easy it is to remodel.